Let’s face it, Dad has a way of lighting up our lives. And he takes his job of keeping kids safe seriously, especially when it comes to fireworks. This Father’s Day, let’s make Dad’s summer a blast while we make his job a little easier. 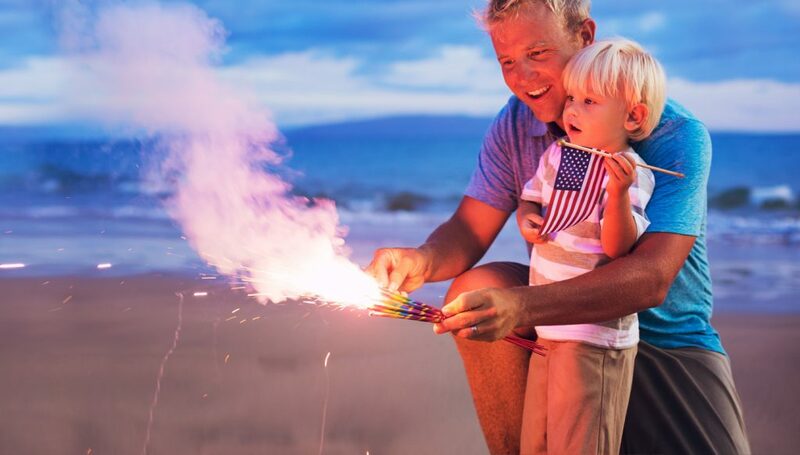 Share these 5 important fireworks safety tips that every dad (and mom and human) should know and practice this Fourth of July and all year long. There’s a reason why some states outlaw many types of fireworks: fireworks are really dangerous. Hands down, the best way to keep everyone safe around fireworks is to pack some snacks, spread a blanket and enjoy the show in your area. Get on Google and find out where professional pyrotechnics experts will be safely lighting up the night near you. Wear gloves while handling sparklers. Keep them away from their own and other people’s faces, clothing and hair. Extinguish in a bucket of water. Do not run with a lit sparkler. Also, never allow kids to pick up pieces of fireworks after an event. Some could still be hot or ignited and could explode at any time. Legal fireworks will carry a label with the manufacturer’s name along with instructions for correct and safe storage, handling and use. Always store these in a cool, dry place. Illegal fireworks are usually unlabeled and have names like “M-80,” “M100,” “blockbuster” or “quarter pounder.” These kinds of explosives were banned in 1966, but many people are still injured every year because of them. If you’re going to light fireworks, again, make sure they’re legal and that you light them in an open area that is clear of brush, leaves and flammable substances and point them away from people, homes and property. Always wear safety glasses and gloves while handling them. Light one firework at a time, and don’t hold them in your hand or position any part of your body over them while lighting. Also, never, ever relight one that fails to ignite. Keep a bucket of water nearby to soak extinguish fireworks. And again, never let children handle fireworks. Don’t take chances. If an injury looks serious, even if you’re not sure how serious, call 911 immediately. But even minor burns, cuts and eye injuries can become infected easily, so it’s important to get them treated right away. MDLIVE can treat minor injuries quickly and easily by phone, computer or mobile app, and if necessary, send prescriptions directly to your nearest pharmacy. Let’s hear it for Dad this Father’s Day! Share this post with anyone who is a dad, loves a dad, or just wants to help dads everywhere do what they do best – keep kids safe while having a blast.